What’s expected of a career military man? And what’s expected of a human being? These questions are at the heart of Michael Powell and Emeric Pressburger’s epic masterpiece, The Life and Death of Colonel Blimp. Made in London at the height of World War II, it follows the 40-year career of Clive Candy (later Clive Wynne-Candy) through three wars and the peaces in between. Candy is a decent fellow, born into money but not prone to putting on airs. He believes that rules and traditions are there to be followed, and he takes great pride in the fact that England always fights honorably (his viewpoint, and the film’s but not mine). His beliefs will be challenged over the picture’s nearly three-hour running time. It’s an easy, entertaining, and thoughtful three hours. Powell and Pressburger have filled the story with love, heartbreak, humor, light satire, cinematic panache, and a remarkable talent for moving the story forward in unusual and delightful ways. I discussed this film in detail last October, in Love, Friendship, Aging, and Playing by the Rules: The Life and Death of Colonel Blimp, and I don’t want to repeat myself. So let me mention a few things I didn’t bring up then. Although the film encompasses a man’s life, it avoids much of what would conventionally be considered dramatic or exciting. We know, for instance, that he received the Victoria Cross during the Boer War, but we’re never shown why. Important characters die in the years between one scene and the next. But Colonel Blimp isn’t about the big, exciting moments. It’s about friendship, love, and adapting to changing time. But then, so is life. The British Government, and especially Winston Churchill, hated this film and wanted to keep it from getting made. This seems odd, because Colonel Blimp may be the most patriotically British film ever made. It glories in England’s sense of fair play (which was never all that fair), even as it preaches that the time for fair play is over. I admit to being confused by one off-screen transition. When he’s young, he’s Clyde Candy. After he marries a woman named Barbara Wynne, he remains Clyde Candy, and she’s Mrs. Clyde Candy. Then he’s suddenly Clyde Wynne-Candy. I don’t know if such name changes were common in England in the first half of the 20th century. However the main character got his name (which, either way, isn’t Colonel Blimp), this is a film to see, to revisit, and to treasure. 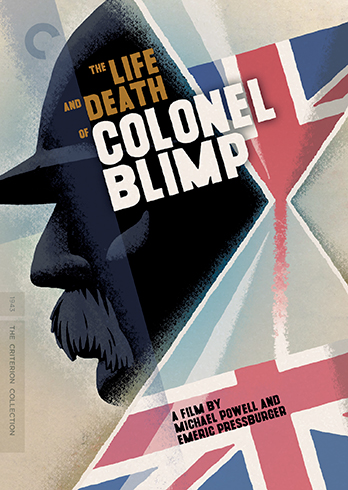 Like most Criterion discs, The Life and Death of Colonel Blimp comes in a clear plastic case with an artful cover. Inside you’ll find a single disc, and a colorful booklet dominated by an essay by Molly Haskell. Cinematographer Georges Perinal shot Colonel Blimp in three-strip Technicolor, and used that amazing and difficult format in subtle and beautiful ways. The film has recently undergone a major, 4K restoration, and when I saw it theatrically last fall, it looked great. It still does. The details, the rich color palate, and the way the color red pops when the filmmakers want to control your eyes, all work as they should. It’s a great-looking disc of a great-looking film. As is Criterion’s custom, the original mono track is reproduced here in uncompressed PCM. There were a few moments when I had trouble understanding the dialog, but not many. For the most part, it was a reasonably good reproduction of a well-made 1943 soundtrack. Commentary by Martin Scorsese and Michael Powell: Powell clearly recorded his commentary first, and Scorsese (a major fan of the film) came in later to fill the blank spaces–or at least some of them. Powell, who was 82 or 83 when he recorded the commentary in 1988, speaks in a dull monotone, although the stories he tells are fascinating. Scorsese’s stories are better told, but not quite as interesting. There’s too much time when neither of them is speaking. Introduction by Martin Scorsese: 14 minutes. HD. He covers quite a bit of ground here, discussing his first time seeing the film on TV as a child, the problems with the British war office, and how the government kept Laurence Olivier from being in the picture. He also discusses how Colonel Blimp influenced Raging Bull. A Profile of Colonel Blimp: Making of doc. 24 minutes. SD. Made in 2000, this is a reasonably interesting but conventional making-of doc. Restoration Demonstration: 5 minutes. HD. Very briefly, Scorsese describes three-strip Technicolor, the issues involved with restoring it, and the challenges that this particular film brought with it. Optimism and Sheer Will: 29 minutes. HD. Thelma Schoonmaker Powell is both Scorsese’s film editor and Powell’s widow. Here she discusses Powell’s personal relationship to the film. Oddly, the credits are in French. David Low’s Colonel Blimp: Years before the movie, cartoonist David Low created the character of Colonel Blimp. Here we get a collection of his cartoons. I can’t help thinking these would look better in a book.